Show all your friends! If you have a youtube channel of any size, please reupload. As many of you already know, this Saturday there will be an Easter party which will include an Easter egg hunt in which you can earn keys for our special Easter event crate as well as tokens, a drop party, a x4 token multiplier Easter weekend, and a 30% off sale on everything in /buy from 3/31/18 to 4/7/18. The details on the Easter egg hunt as well as the corresponding crate are still being worked on, but updates will release soon. We plan to have a special event area for Easter, where eggs will be hidden and the drop party will take place. The egg hunt will require teamwork as each player will be allowed to claim each egg once, and if all eggs are found, you will get your reward. Easter crate keys will also be added into /buy and into the current 2 crates as well, and also into word scrambles. For any of you that were around then, this will look very similar to what we used to call "The Zone"
The drop party will contain rare items, possibly rank vouchers/coupons, and items and keys for the event chest. You won't want to miss it. The date for this party will be set THIS SATURDAY, not Sunday. This is because many people have plans or have to go to Church on Sunday, and we want to see as many of you all on as possible. The time should be set around 6pm Central. This may not be convenient for all of you, but it as close as we can get to during the day for everyone. You may have to get up early or stay up late in order to attend, depending on your location, but this will be worth the lost sleep. THIS TIME IS SUBJECT TO CHANGE, PLEASE CHECK DISCORD FOR UPDATES! The Easter crates will last all week, so if you don't get any keys on Saturday, you'll still have a week to earn them. If you have any suggestions or requests for this event, please let us know in the comments or on our discord. And if you're not in our discord, why aren't you? Note: This is currently NOT a feature on the server. Some of you may be familiar with the current pipe system we have, which is part of Craftbook. This is a much more efficient and customization version of that. Using primarily iron, you'll be able to make extremely simple or crazy complex pipe systems making your automated farms require even less effort. This may be a learning curve, but this addition is very easy to use once you've got it down. Pipes use a separate texture pack for different looks, however the texture pack is not mandatory for use, just highly recommended. These are basic pipes, only used in between other pipe types to move items back and forth. Less material makes 4 of them instead of 1 because they have no specialization. These pipes can be colored, which is merely for display. Different colored pipes behave the same but do not connect to one another. Ice pipes are exactly the same as standard pipes, however items in them move significantly faster. These will probably take a little bit of playing around with to understand. Simply destroy all items which travel through them. The Crafting Pipe gives you the possibility to automate crafting processes. After specifying a crafting recipe, all items going into this Pipe will be cached and the result item is going to be crafted as soon as enough ingredients are cached. By right-clicking this Pipe with a wrench, first you can define the output direction in which the crafted items will go and second you can see the cached items, used to craft the result item. By shift-right-clicking this Pipe with a wrench, you can define the crafting recipe. Just place the ingredients in the given workbench matrix and save it by closing the inventory. The picture above is my example of a golden pipe to better help you understand it. The purpose of the golden pipe is to sort items. The GUI shown directly above (in a gyazo link because I can't upload any more files ) is opened with the wrench and is used to set where items will end up. As you can see, I've set redstone to travel through green and iron to travel through black. If you look above, out of all the pipes green is facing towards the middle on top, meaning the redstone will travel towards the top chest, and the black is facing the middle on the bottom, the iron will go into the bottom chest. This can be done with as little as 2 and as much as 6 items, and if you only wanted to sort redstone and iron you would only need the top and bottom pipes. This is also pretty complex and will take some time to learn. Probably the most important, the extraction pipe actually extracts items from the chest, hopper or other storage container. A redstone signal is needed to power an extraction pipe unless you right click the pipe with a wrench and change to "EXTRACT ALWAYS" in its GUI menu. You can also change the amount of items it extracts by clicking the the brick block in the GUI menu to change it to 16 items. The wrench is used to edit certain pipes as specified above. Hopefully you can have some fun with these pipes, they seriously up the limit on your creativity! Edit: Pipes can create lots of lag if you have a large amount in a small area because the moving items displayed counts as entities. To fix this, do /tpipes settings and you can disable seeing items for you personally, getting rid of the lag. Nether Islands or Original Nether? Would you all rather have a standard nether or separate nether islands? Have a separate island in the nether world that would server as essentially a second island to you. No major difference aside from nether theme to the island, starter island composed of nether items, and ability to grow glowstone trees. This island would most likely be smaller than your main island but would server as a separate building space. No major effect on the economy. Full access to the nether at your disposal from a portal on your island. If this was implemented, you'd be able to harvest and sell nether items for most likely relatively low prices. Flight would be disabled. You'd be able to make a small protection claim in the nether to setup base. There's a pretty big difference between the two, but we can't do both. If you have a preference, let us know by voting in the poll and explain why you chose your side in a comment so we can get a better idea of where you all stand. 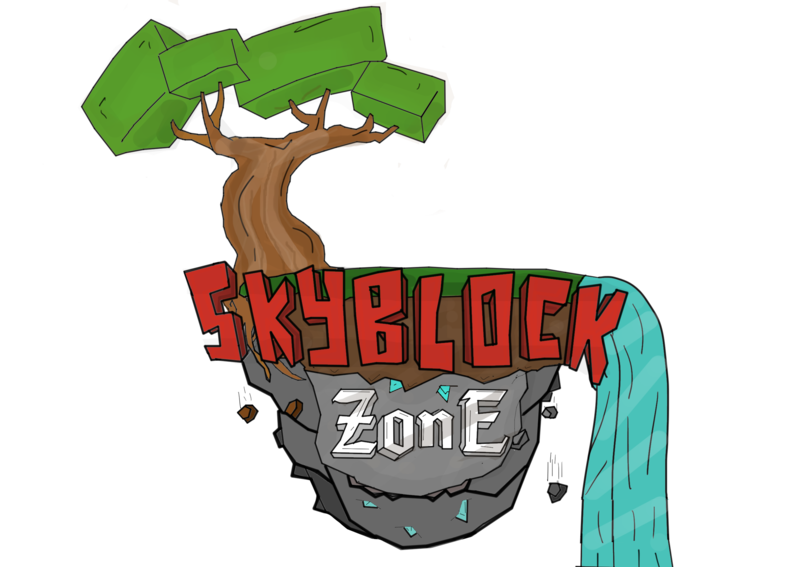 After long months of downtime, we've decided to bring back Skyblock Zone. After our developer OfficerJava sadly passed away last year, we were unable to extract the server from a dedicated server only he knew how to operate. Recently, we've salvaged the files we could, such as the spawn and small other aspects, and started over from scratch to make a new Skyblock Zone, based of the beginning of the last one. This time there is no network, no expansion, just an exclusively skyblock server for you exclusively skyblock players. I'm happy to say this server should be open this weekend. Nothing will carry over from last server besides your rank, so if you had a rank from the previous server and wish to have it on this one, please private message me here or on discord and I will make sure you receive the equivalent new rank to what you payed for.